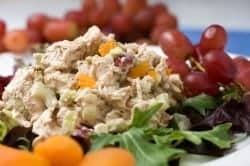 This is a delightful and refreshing chicken salad, fresh vegetables, mangos, and chicken make for a wonderful salad. This recipe was originally spotted in the Fort Worth Star Telegram. Chop chutney in food processor 15 to 20 seconds using on/off switch. Combine mayonnaise and curry powder in bowl and blend well. Stir in chutney. Cover and chill. Bring large pot of salted water to rapid boil. Add broccoli and cook until crisp tender (about 1 minute). Drain, then place in cold water to prevent further cooking. Drain again, pat dry. Skin and debone chicken. Cut meat into bite-size chunks. Combine chicken, broccoli and red bell pepper and toss gently. Blend in sauce and mix gently again. Chill well and serve. Curry and mango add a special touch to this chicken salad. Chop chutney in food processor 15 to 20 seconds using on/off switch. Combine mayonnaise and curry powder in bowl and blend well. Stir in chutney. Cover and chill. Bring large pot of salted water to rapid boil. Add broccoli and cook until crisp tender (about 1 minute). Drain, then place in cold water to prevent further cooking. Drain again, pat dry.Skin and debone chicken. Cut meat into bite-size chunks.Combine chicken, broccoli and red bell pepper and toss gently. Blend in sauce and mix gently again. Chill well and serve. I loved the Santa Fe Chicken Salad. Do you have any idea how Chris made i? I wasn’t sure about this but it was fabulous! I will be making this for my friends!